Essay writing in middle school is an essential skill for homeschoolers. Geared to give your student a successful experience, Middle School Guide to Essay Writing, by Marilyn Groop, will introduce essays to your homeschool in this user-friendly, no-busywork format. The Guide includes 3 essay rubrics that you can use to grade the essays, as well as an answer key to the short-answer essay test. 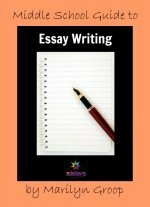 Click here to view an excerpt from Middle School Guide to Essay Writing. Essay Writing in Middle School.